Palestine, Texas– Every time Wyma and Co. opens the doors of their 100+-year-old home it feels like Christmas! Inside of the historic home is a menagerie of antiques and vintage collectibles sure to remind you of days gone by. This summer, Wyma and Co. will open for a two-day sale on July 18 and 19, just in time for the second Annual Christmas in July Celebration. That is what I call perfect timing! Mark your calendar, call up the girls, and start planning a day trip to Palestine! Wyma Missildine, owner of Wyma and Co. has long since had a passion for antiques and vintage treasures. What began as a weekend pastime with her mother nearly 50 years ago has led her on an endless pursuit of treasure hunting. According to Wyma, by 1994 the walls of her house were caving in with all of her adopted vintages finds therefore, she started finding homes for all of her treasures through various antique malls and shows. When her booths became full she began toying with the idea for a semi-annual home show. Right about that time, Wyma’s husband Steve’s childhood home became available. The 2,000 square foot house, located at 418 Coronaca Street, was built in 1906. Wyma knew that it would be the perfect place to house her impressive collection of antiques, and there was even enough room to ask her favorite fellow antique addicts to contribute! Thus, the semi-annual Wyma and Co. home show was born. The house has since undergone a facelift. Old carpet was removed, hardwood floors were revitalized, sheetrock was put in place, along with a fresh coat of paint, and various other projects. I had the opportunity to preview Wyma and Co.’s pop-up sale opening in July. I spent well over an hour browsing Wyma’s shelves and backyard. And truth be told, I could have stayed an hour longer. From teacups to cupboards, Wyma and Co. has it all! Vintage furniture, clothes, books, perfumes, toys, art…etc. You name it and Ms. Wyma has it. Plus, you can take a little inspiration home for free! Everything that is marked with Wyma’s tags will be 20% off during this two-day sale. Folk Artist Janet Staples will also have several of her handmade Santas, Uncle Sams and Easter bunnies and eggs available at the sale. Wyma and Co.’s special summer sale will run Friday, July 18, from 9 a.m. until evening and Saturday, July 19, from 9 a.m. until evening. Palestine is the perfect East Texas day trip and weekend destination! 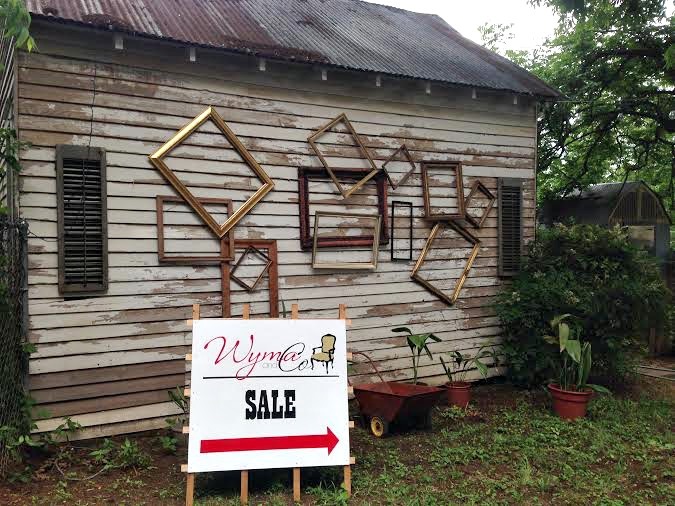 Make plans to attend the summer sale at Wyma and Co. this July, and while you are in Palestine be sure to check out the Historic Home District, shop downtown, visit local wineries, see a show at the Historic Texas Theatre, visit the Museum for East Texas Culture, and have lunch and/or dinner at one of the many local eateries! For more information about Wyma and Co. visit www.wymandco.com. Learn more about Christmas In Palestine. Like the Palestine Visitor Center Facebook page for updates. Or download the Palestine, Texas App! AUSTIN— Despite lingering dry conditions in some parts of Texas, prospects for this year’s spring turkey season remain promising, thanks to a carryover of mature gobblers, according to Texas Parks and Wildlife Department biologists. Jefferson- This weekend, in Jefferson, you can enjoy country music the way it was done back in the day and the way it’s done today. Jefferson welcomes two talented country music artists to town; Justine Blazer and Jake Penrod.